Geological hazards or geohazards is the study of the interaction of physical Earth processes with people and environments at different scales. Geohazards represent a source of danger from the ground conditions and may pose a risk to human health and/or the environment with associated cost and disruption. They very often represent a consequence of an adverse combination of ground conditions. The public’s understanding of the implications of adverse ground conditions on the stability of their property, with the associated impact on property values, is growing. Consequently, there is an increasing demand from the public and commercial interests for information about geohazards to address and understand the interaction between land use and the environment. There is therefore an increasing need for detailed data that is related to the identification and assessment of potential geological hazards in Northern Ireland. These datasets will be used to highlight areas that require further study and help quantify risk associated with development. Geohazards and their potential impact can be incorporated into procedures for land use planning and to help ensure sustainable development in a safer environment. The ground people stand on, and which supports our buildings and roads, is mostly stable. However, each year millions of pounds is spent repairing the damage caused by subsidence of the ground surface. Relatively small, differential movement of the ground has the capacity to cause problems to man-made structures such as buildings, or may cause unevenness or disintegration of roads and disruption to water, electricity and sewage systems. Commonly, the geological conditions that cause the problem are related to the superficial deposits at a particular site and only rarely may the cause be attributed to natural conditions in the bedrock geology. 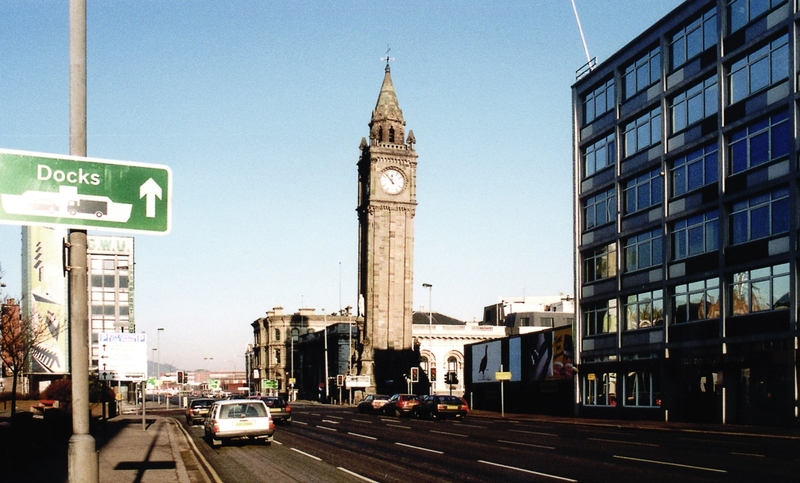 In Northern Ireland, the most commonly occurring compressible materials include deposits of peat and lacustrine clay and, in low-lying parts of Belfast and Londonderry, estuarine clay referred to as ‘sleech’ (P947882). All of these materials can allow subsidence if foundations are inadequate, or if through time they fail. A classic example of the effect of subsidence due to failure of inadequate foundations and to the presence of the sleech is the leaning Albert Clock Tower in Belfast [J 342 745] (P948062). Remedial action has stabilised the tower and prevented an increase in the angle of lean which reached a maximum of 1º, equivalent to 0.77m of movement from the vertical (Doran Consulting, pers. comm, 2003). In the Belfast area (P947879), the distribution of the sleech is representative of the former extent of the estuary of the River Lagan and Belfast Lough in early post-glacial times. It is over 15m thick in the docks area of the city and 3–10 m in the commercial and inner city areas . Other examples of superficial deposits that are naturally soft or loose or prone to flow, and as such are compressible, include alluvial deposits associated with river floodplains, windblown sand, and deposits of fluvioglacial sand and gravel. Geotechnical information on the distribution, thickness, and physical and chemical properties of superficial deposits and bedrock is essential at the earliest planning stage of a development. Datasets held by the Geological Survey of Northern Ireland contain relevant geological and site-specific information on ground conditions. This includes geological maps at a variety of scales and associated literature, in excess of 40 000 records of boreholes and trial pits in site investigation reports with location maps and the results of geotechnical testing of samples. All underground cavities regardless of whether they are natural or man-made pose a potential danger. In the natural environment, because the development of such features is gauged on geological timescales, underground cavities may appear stable. However, in all cases they are evolving and subtle, long-term, changes to their stability may eventually cause collapse and surface subsidence. It is therefore important to understand the processes that lead to the formation of such voids combined with data on their distribution, size, depth below ground level and the bedrock type. Natural cavities, including caves and swallow holes, are common where there is limestone bedrock, for instance in Co. Fermanagh (Carboniferous) and in Co. Antrim (Cretaceous). Cave systems and surface karst pavements are developed in the outcrop of the Carboniferous Dartry Limestone Formation in Co. Fermanagh . Solution of the limestone by acidic water led to the formation of the caves that are still partially utilised by the existing river network. Age dating of flowstone indicates that the caves were mature during the Pleistocene when the calcite was deposited. The most spectacular cave system in Co. Fermanagh is accessed (inter alia) at Marble Arch [H 121 344] but the underground hydrological network extends for at least 10 km to the west towards Shannon Pot in Co. Cavan. 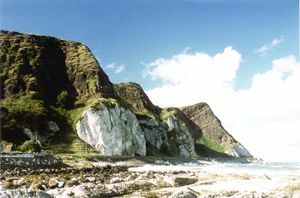 In Co. Antrim, cave systems developed in the Cretaceous Ulster White Limestone Formation at the margins of the Antrim Plateau. The most recent cave systems were initiated during post-glacial (Holocene) times and are still forming , . Since the arrival of man in Ireland some 9000 years ago the impact of his exploitation of its natural resources has helped shape our present-day landscape. The exploitation of natural resources by underground mining commenced in Northern Ireland about 200 years ago and left a legacy of surface instability above disused mine workings for coal and other minerals. The existence of abandoned mine workings is a serious problem in relation to planning, development and environmental protection. 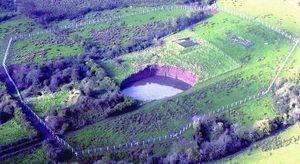 The Geological Survey of Northern Ireland Abandoned Mines Database has information on the location of over 2000 abandoned shafts and adits, the commodity extracted and plans of some of the underground workings (see Mineral resources article). Between 1853 and 1958, underground extraction of salt from the Triassic Mercia Mudstone Group in the Carrickfergus area of Co. Antrim made use of the pillar and stall method but later resorted to uncontrolled brining. The resulting caverns vary in size and stability, and many have flooded since the closure of the mines. Progressive collapse of those workings and upward migration of voids has since occurred in a number of them. In 1990 the collapse of pillars at a depth of about 100 m in the Tennant Salt Mine [J 432 893] near Carrickfergus , created an elliptical depression some 8 m deep and about 200 x 170 m that eventually flooded (P948063). Similarly the Maidenmount Salt Mine collapsed in 2001 (P948064). 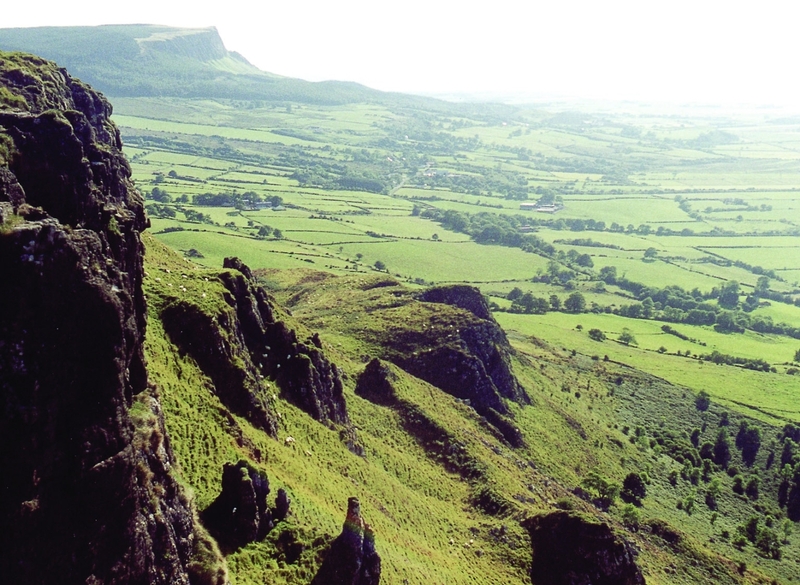 Slope stability is a significant issue in Northern Ireland particularly at the margins of the Antrim Plateau. An area of at least 100km2 is located on sites of historical landslip and is therefore regarded as potentially unstable because of the risk of further slip . Much of the instability occurs naturally but in some cases may be caused or exacerbated by the activities of man. An assessment of ground stability is therefore imperative for such areas that are to be designated for development, if it is suspected that mass movement is a potential hazard. 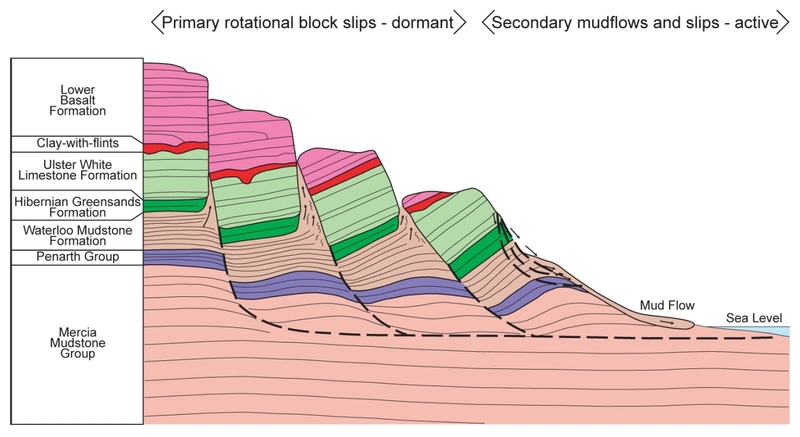 The form, extent and status of landslides depends on factors such as the solid and superficial geology, slope angle, hydrology, hydrogeology and rainfall. As an exacerbating factor, the activities of man can change stable natural relationships between combinations of these factors and thereby promote slope instability. The margins of the Antrim Plateau often display dormant multiple, large-scale, deep-seated, mainly rotational slumping . The evolution of the landslide complexes is related to the stratigraphic succession comprising competent cliff-forming basalt lava and chalk overlying the incompetent and impervious Jurassic Waterloo Mudstone Formation and Triassic Penarth and Mercia Mudstone groups (P947912). Undercutting of the basalt and chalk by removal of the underlying incompetent strata by the action of ice sheets led to slumping during and soon after the last Ice Age. Where present, the highly permeable Hibernian Greensands Formation also plays an important role in the landslip process. Movement took place on a vertical or steeply inclined composite surface in the basalt and chalk but assumed a listric form in the underlying high plasticity mudstones. Nevertheless, the impact of secondary activity such as rock falls, shallow slumps and translational slides and mudflows, some triggered by man-made excavations, is still evident. The sense of backwards rotation on the spectacular masses at Garron Point in Co. Antrim is emphasised by the disposition of the contact between the black basalt and white chalk (P948065). At the escarpment edge their contact is almost horizontal but in the slumped blocks it is steeply inclined into the hillside. Other examples occur in Co. Antrim at White Park Bay  and along the coast south of Glenarm ,  where the area of rotational landslip is at least 1.5km wide, in Co. Londonderry at Binevenagh [C 692 302] north of Limavady (P948066)  and at Benbradagh [C 722 113]. Southeast of Glenarm at Minnis North [D 339 137], mud slides and flows of liquefied Jurassic mudstone periodically cascade down-slope in well-defined and deeply incised chutes . Remedial measures including retaining walls and under-road drainage are occasionally overwhelmed by the quantities of mud involved in the flows (P948067). Rock falls and accumulations of block scree are associated with cliffs and are promoted by rainfall, frost action and the growth of roots. The majority of scree accumulations are associated with cliffs around the Antrim Plateau, for example Fair Head in north Co. Antrim . In Co. Fermanagh, cliffs of Carboniferous limestone produce scree consisting of small blocks while early Namurian sandstone forming the summit cliffs on the north face of Cuilcagh Mountain  produce large accumulations of active block scree above Lough Atona [H 110 293]. However, in most cases the scree is stabilised by vegetation. Rivers channel excess water from catchment areas and drain both the land surface and sub-surface aquifers. In the upper reaches of most catchment areas the rivers are eroding their bed and banks, transporting the material downstream to be redeposited on flood plains. 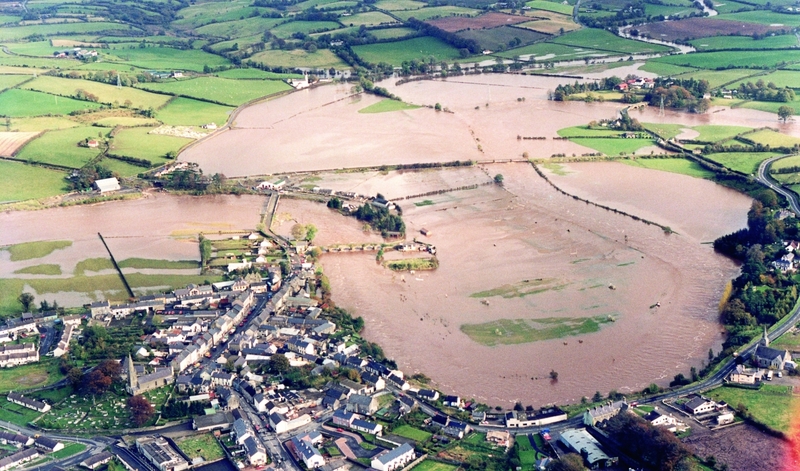 All flood plains in Northern Ireland have developed in post-glacial times and are associated with areas of alluvium. In upland regions such as the Sperrin Mountains, alluvial flood plains are typically narrow and are confined by the steep sides of valleys. 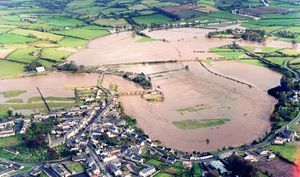 In contrast, rivers such as the Bann develop extensive flood plains up to 2 km wide such as west of Ballymoney in Co. Antrim. The incidence of severe flooding in many parts of the British Isles is becoming more frequent (P948068). While this is often blamed on climate change there is also a consequence of improving drainage in upland catchment areas, increased ground cover through urbanisation and over-compaction of soils in agricultural land. Whatever the cause or causes, urban development on flood plains in major cities is a potentially intractable problem. At coastal locations the impact of even small rises in sea level will be significant for a large proportion of the world’s population. It would also threaten the integrity of strands, dune systems, estuaries and tidal flats and, as in early post-glacial times, could undermine cliff sections possibly causing renewed landslides, increased erosion and rock falls around the coast of Northern Ireland. ↑ Geological Survey of Northern Ireland, 1971. Special Engineering Geology Sheet. Solid and Drift. (Reprinted 1984). 1:21 120. 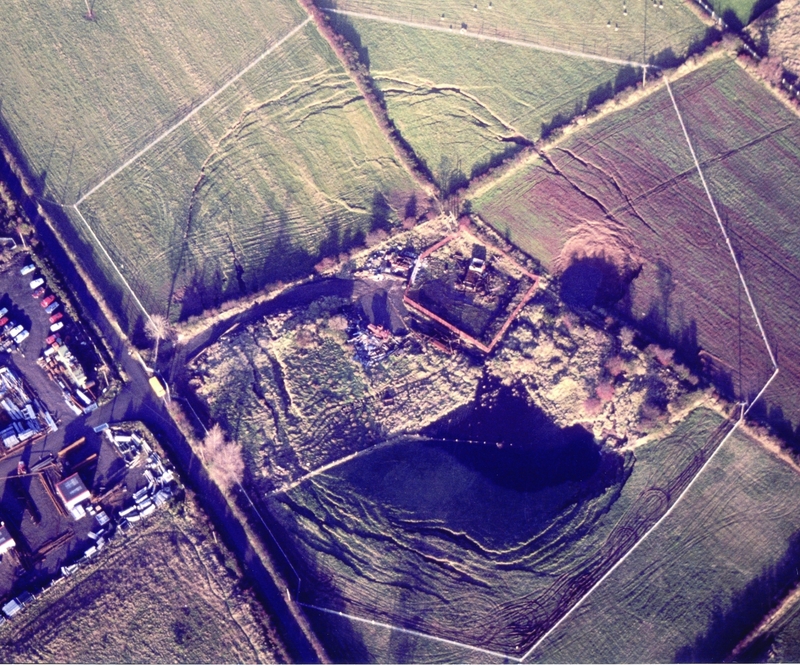 (Keyworth, Nottingham; British Geological Survey). ↑ Jones, G, Ll, Burns, G, Fogg, T, and Kelly, J G. 1997. The caves of Fermanagh and Cavan. The Lough Nilly Press, Florencecourt, Co. Fermanagh, Northern Ireland. ↑ Barnes, S. 1999. Karstic groundwater flow characteristics in the Cretaceous Chalk aquifer, Northern Ireland. Quarterly Journal of Engineering Geology, 32, 55–68. ↑ Kelly, J G, Fogg, T, and Enlander I. 1996. Holocene and Tertiary karstification in the Ulster White Limestone Formation (Cretaceous) of the Garron area, County Antrim, Northern Ireland. Cave and Karst Science, 23 (3), 93–100. ↑ Griffith, A E. 1991. Tennant’s ills. Ground Engineering, November. ↑ Forster, A. 1998. The assessment of slope instability for land use planning: A case study on the northeast Antrim coast. British Geological Survey Technical Report WN/98/8. (Keyworth, Nottingham). ↑ Wilson, H E, and Manning, P I. 1978. Geology of the Causeway Coast. Memoir of the Geological Survey of Northern Ireland, Sheet 7, HMSO, Belfast. ↑ Carney, J N. 1974. A photo-interpretation of mass movement features along the Antrim Coast of Northern Ireland. British Geological Survey Technical Report WN/EG/74/13. ↑ Hutchinson, J N, Prior, D B, and Stephens, N. 1974. 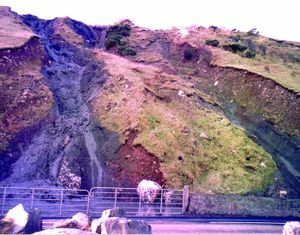 Potentially dangerous surges in an Antrim mudslide. Quarterly Journal of Engineering Geology, 7, 363–76. ↑ Bazley, R A B, Brandon, A, and Arthurs, J W., 1997. 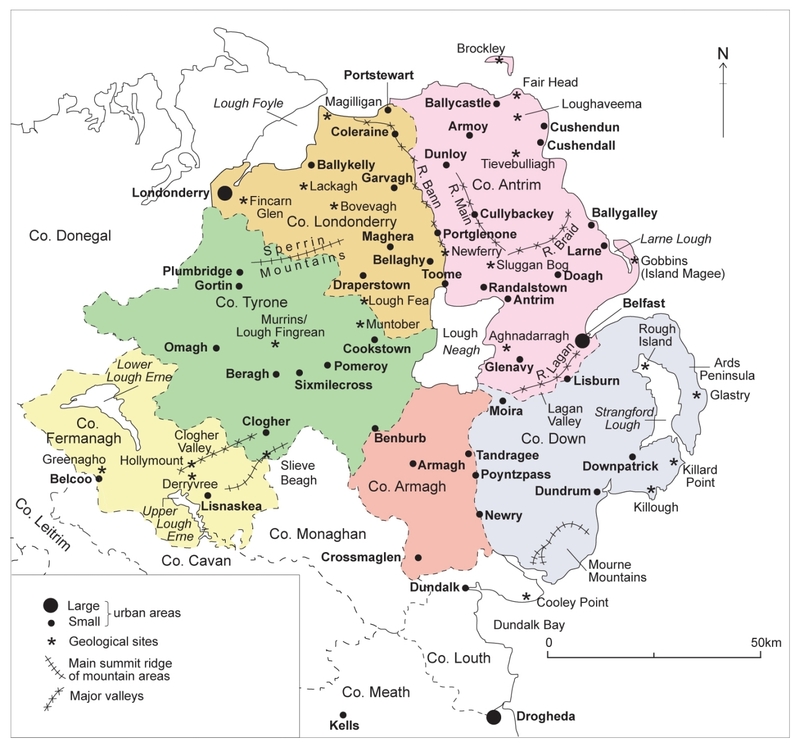 Geology of the country around Limavady and Londonderry. 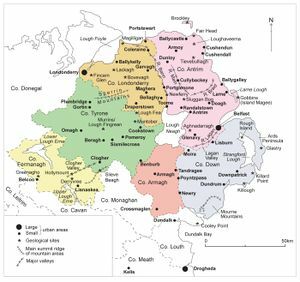 Geological Survey of Northern Ireland Technical Report GSNI/97/1. ↑ Hutchinson, J N, Prior, D B, and Stephens, N. 1974. 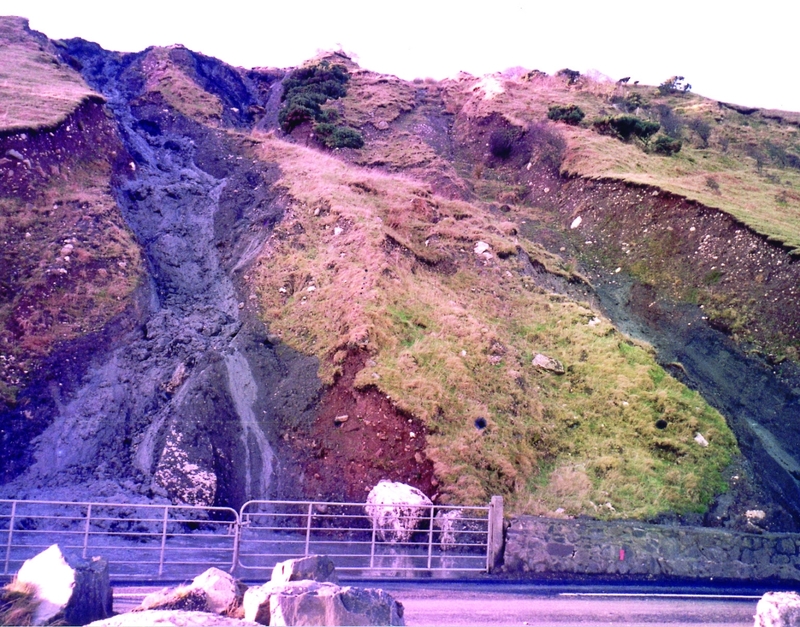 Potentially dangerous surges in an Antrim mudslide. Quarterly Journal of Engineering Geology, 7, 363-76. ↑ Geological Survey of Northern Ireland 2002. Ballycastle, Northern Ireland Sheet 8. Solid Geology (second edition). 1:50 000. 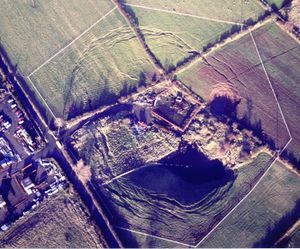 (Keyworth, Nottingham: British Geological Survey). ↑ Geological Survey of Northern Ireland 1991. Derrygonnelly, Northern Ireland Sheet 44, 56 and 43. Solid Geology. 1:50 000. (Keyworth, Nottingham: British Geological Survey). This page was last modified on 25 September 2017, at 13:26.